S.A.C. 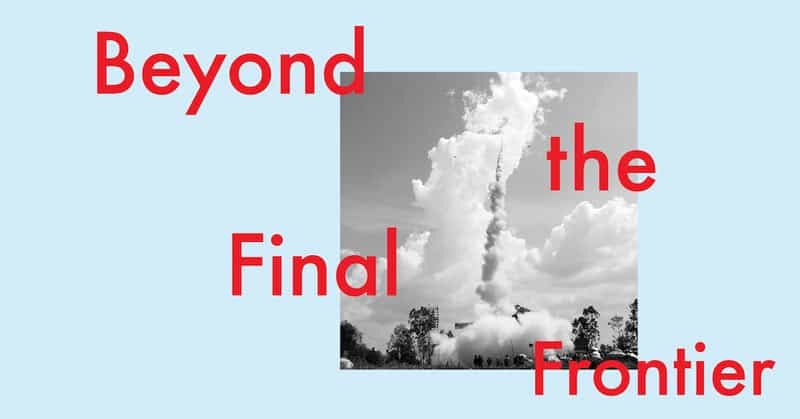 Subhashok The Arts Centre is pleased to present Beyond the Final Frontier. Curated by Berlin-based curator Lauren Reid, the exhibition will feature local and international artists and researchers. Through sound, scent and vision, visitors will be immersed in a sensory experience of outer space in the heart of Bangkok. We are at a significant moment: NASA predicts that in 2030 humans will reach Mars. As of May 2018 3,793 exoplanets have been discovered, which can potentially or may already be supporting life. The dream of humans traveling further to outer space and even colonizing it are becoming more tangible. But still, very few people have ever been beyond the atmosphere of the Earth. Outer space exists mostly in our imaginations or in scientific data. The vast majority of us can’t touch it, hear it or exist within it…yet. However, when we look around, we start to find many signs of outer space already here in our daily life: maps of the stars can be found inside local temples, a UFO beaming out the dirt of our stained clothing appears on a laundry detergent packet, even the days of the week are named after the planets, the sun and moon. This exhibition then asks, how does speculating on other worlds teach us about Earth, ourselves, and our place in the universe? For Beyond the Final Frontier, visitors will encounter two specially commissioned works: a soundscape of outer space based on recorded audio of daily life throughout Thailand by Arnont Nongyao, and a series of different ‘scents of space’ created in collaboration with astronomy enthusiast Visanu Euarchukiati. Artists Chulayarnnon Siriphol, Prapat Jiwarangsan and Takuro Kotaka will present multimedia works that explore our futures in relation to outer space and how they are reflected in Thailand today. These works will be interspersed with scenes documented by the curator Lauren Reid where the everyday and outer space collide, from the rocket competition of Bun Bang Fai in Yasothon, to extraterrestrial believers camping on Kaokala in Nakhon Sawan. Though these works, we will journey beyond the final frontier to find ourselves grounded firmly back on Earth. Prapat Jiwarangsan (born 1979, Bangkok) is a visual artist from Thailand with a strong background in interdisciplinary art and research. He works across a variety of media, especially photography and video, in order to investigate and represent the relationships between history, memory, and politics in Thailand—particularly in relation to the theme of migration. In the past four years, he has researched and developed a practice that explores the experience of migrant workers outside of their home countries. His installations have been exhibited in Bangkok, London, Hong Kong, and Gwangju while his videos have screened at international film events such as Canada’s Image Festival, International Film Festival Rotterdam, Experimenta India, and Onion City Experimental Film and Video Festival. Takuro Kotaka (born 1984, Saitama, Japan) is an artist and filmmaker who has stayed in many countries throughout Africa, Asia, and the Middle East, creating work based on themes such as rumours and forgotten symbols that cut deep into political issues. His recent films are a series of works that blend together sci-fi, humor, and documentary/fiction with societal systems and difficult histories. His works have been presented in several film festival and exhibitions across the world including Painnale 2018 CMU Art Museum, Chiang Mai, Bangkok Biennial 2018 Whiteline, Bangkok, Oku-Noto Triennale: SUZU (2017) Ishikawa, Japan, Jakarta Biennale XIII ARENA Indonesian National Gallery, Jakarta (2009), KITA!! : Japanese Artists Meet Indonesia Selasar Sunaryo Art Space, Bandung, 56th International Short Film Festival Oberhausen Lichtburg Filmpalast, Oberhausen, (2009). Arnont Nongyao’s (born 1979, Bangkok) practice centers on experimentation with vibrations that are derived from humans, organisms, things, and social forms. His works usually result in performance or installation, often in site-specific or public spaces. Arnont is Co-Director of Chiang Mai Collective (CMC), an open network of innovative sound artists and practitioners in Chiang Mai. Arnont has presented his work widely at various exhibition and festival platforms locally and internationally, including Bangkok Art and Cultural Centre, Chiang Mai University Art Museum, 16th Media Art Biennale WRO 2015 in Wroclaw, Poland, Sa Sa Art Projects in Phnom Penh and Manif d’art, Quebec. Chulayarnnon Siriphol (born 1986, Bangkok) works in short film, experimental film, documentary and video installation which are in-between personal memory and social memory, documentary and fiction, reality and supernatural. Chulayarnnon has presented his work extensively in Thailand and abroad, including in The 34th International Film Festival Rotterdam, Netherlands (2005), the 26th Hamburg International Short Film Festival, Germany (2010), Can You Hear Me?, Objectifs Centre for Photography and Film, Singapore (2012), Sharjah Biennial 11, United Arab Emirates (2013), the 4th Moscow International Biennale for Young Art, Moscow, Russia (2014), The 5th Fukuoka Asian Art Triennale, Fukuoka, Japan (2014), Cannes International Film Festival, France (2018), and Ghost:2561 (2018). Visanu Euarchukiati (born 1962) is a Thai astronomy enthusiast and science historian. An active member of the Thai Astronomical Society, Visanu currently serves on the executive committee of the Society and played a major role in the production of Thailand’s first English-Thai Dictionary of Astronomy. He also writes and translates astronomy articles for magazines and has a book of astronomy tidbits and anecdotes published under his name. His special interests in astronomy cover archeoastronomy and star tales. Visanu is the publisher of a podcasting website Khaikhan Nithan Dao, telling star tales from all over the world in Thai language. Lauren Reid (born 1983, Melbourne) works across curating, film and anthropology. Her research results in exhibitions, writing and moving images that combine cultural artifacts, documentary sources, field recordings, artworks and artistic references. She is Co-Director of insitu collective, Lecturer in Curatorial Practice at Node Centre for Curatorial Studies, Co-Founder of the Project Space Festival Berlin and a PhD Candidate in Social and Cultural Anthropology at the Freie Universität, Berlin with the project Thinking Beyond the Final Frontier: Perception and Representation of Outer Space in Thailand. Since 2010, Lauren has curated over thirty exhibitions at locations such as the Moscow Museum of Modern Art for the IV Moscow International Biennale for Young Art; KW Institute for Contemporary Art, Berlin, Germany; Kunsthal Viborg, Denmark as part of the European Capital of Culture 2017; and Kunstverein Göttingen, Germany. Date: 19 January 2019, 2:00 – 5:00 PM. You are cordially invited to participate in a workshop as part of the exhibition titled Beyond the Final Frontier on Saturday 19 January 2019, during 2 – 5 pm. In this workshop, participants will playfully start to explore creative questions related to space: what are the sights, smells, sounds and sensations that we might experience when journeying beyond the Earth? What ethical and philosophical questions do we need to ask as humans to prepare for space exploration? We will then bring our insights together to each develop one component of a future encounter in space: a soundscape, an atmosphere, a landscape, and a dialogue. In the end, all of the elements were brought together to create a 2-minute film vignette of a speculative scenario in outer space. The workshop will be in English with Thai translators. It is free and open to creatives and enthusiasts without age and experience restrictions. ผลงานของทาคูโระได้ถูกนำไปแสดงในเทศกาลภาพยนตร์และนิทรรศการต่างๆมาแล้วทั่วโลก เช่น Painnale 2018 CMU Art Museum, Chiang Mai, Bangkok Biennial 2018 Whiteline, Bangkok, Oku-Noto Triennale: SUZU (2017) Ishikawa, Japan, Jakarta Biennale XIII ARENA Indonesian National Gallery, Jakarta (2009), KITA!! : Japanese Artists Meet Indonesia Selasar Sunaryo Art Space, Bandung, 56th International Short Film Festival Oberhausen Lichtburg Filmpalast, Oberhausen, (2009). อานนท์เป็นผู้ร่วมก่อตั้ง Chiang Mai Collective (CMC) ซึ่งเป็นเครือข่ายของศิลปินและผู้ที่สนใจด้านเสียงในจังหวัดเชียงใหม่ เขาได้แสดงผลงานในนิทรรศการมาแล้วมากมาย ทั้งในและต่างประเทศ อาทิเช่น หอศิลปวัฒนธรรมแห่งกรุงเทพมหานคร, หอศิลป์มหาวิทยาลัยเชียงใหม่, 16th Media Art Biennale WRO 2015 in Wroclaw, Poland, Sa Sa Art Projects in Phnom Penh and Manif d’art, Quebec. เขามีประสบการณ์แสดงผลงานมาแล้วมากมายทั้งในเมืองไทยและในต่างประเทศ เช่น The 34th International Film Festival Rotterdam, Netherlands (2005), the 26th Hamburg International Short Film Festival, Germany (2010), Can You Hear Me?, Objectifs Centre for Photography and Film, Singapore (2012), Sharjah Biennial 11, United Arab Emirates (2013), the 4th Moscow International Biennale for Young Art, Moscow, Russia (2014), The 5th Fukuoka Asian Art Triennale, Fukuoka, Japan (2014), Cannes International Film Festival, France (2018), and Ghost:2561 (2018). เกิดที่เมืองเมลเบิร์น ประเทศออสเตรเลีย ทำงานด้านการจัดการนิทรรศการ, ภาพยนตร์ และมานุษยวิทยา ผลงานวิจัยของเธอได้ถูกนำเสนอผ่านทางนิทรรศการ งานเขียน และภาพเคลื่อนไหว โดยได้รวมเอาโบราณวัตถุ สิ่งประดิษฐ์ทางวัฒนธรรม แหล่งต้นตอของสารคดีต่างๆ การบันทึกภาคสนาม ผลงานศิลปะ และการอ้างอิงทางศิลปะ เข้าไว้ด้วยกัน นอกจากนั้น เธอยังเป็นหนึ่งในผู้อำนวยการของกลุ่ม Institu และเป็นอาจารย์สอนด้านภัณฑารักษ์ศึกษาที่ Node Centre รวมถึงเป็นผู้ร่วมก่อตั้งโครงการSpace Festival Berlin ขณะนี้ ลอเรน กำลังศึกษาในระดับปริญญาเอกด้านมานุษยวิทยาสังคมและวัฒนธรรมที่มหาวิทยาลัย Freie ณ กรุงเบอร์ลิน ด้วยหัวข้อโครงการวิจัย Thinking Beyond the Final Frontier: Perception and Representation of Outer Space in Thailand นับแต่ปีพ.ศ. 25553 จนถึงปัจจุบัน ลอเรนได้ทำงานจัดนิทรรศการมาแล้วมากกว่า 30 นิทรรศการ ในสถานที่ต่างๆหลายประเทศ อาทิเช่น พิพิธภัณฑ์ศิลปะสมัยใหม่กรุงมอสโคว์ ในงาน the IV Moscow International Biennale for Young Art; KW Institute for Contemporary Art, Berlin, Germany; Kunsthal Viborg, Denmark as part of the European Capital of Culture 2017; and Kunstverein Göttingen, Germany. วันเวลา: 19 มกราคม 2562 เวลา 14:00 – 17:00 น.